This week, we had a crew of guys crawling all over the garden in hard hats and tree gear pruning our trees. They grow like weeds here, especially during the rainy season, so this monster haircutting has to be done once a year at least. There was a huge wood chipper parked outside, partially blocking the calle, and our gate stayed open all day long so they could haul debris out to put in the chipper. Adding to the stress, chain saws and pruners were everywhere, with branches falling all over the place, so we and the animals all had to be locked inside all day. We have the “nicest” house in a very Mexican neighborhood, and I am always a little jumpy about who can peer in and check out the property. Having the driveway gates open makes me nervous since I don’t like passers-by being able to see into our garden. Then the plumber was here trying to figure out exactly where our septic tank is located; we have never had a set of plans for the house and no one ever has known exactly where it is. “It’s by the back wall somewhere” was the best the guy who painted the house originally could do, trying to remember back to when the house was built in 2003. Thus no one had ever inspected it or cleaned it out. So, fearing a seriously unpleasant disaster somewhere down the line (literally and figuratively), I said, if this plumber has one of those cameras – as he said he did – and can figure out where the bloody thing is and look at it and tell us it either needs cleaning out or is okay, that would be well worth the investment. So he also was out there banging and running drills and equipment, poking holes in the lawn and chipping out our exterior walls every few feet trying to locate the septic tank itself and the lines that lead to it. He did locate it out back, finalmente, and put a nice new sort of manhole cover on it, so now, if there are problems, it’ll be easy to get septic cleaning equipment down there. This new plumber is replacing the guy we’d used for years, who – sadly – has developed just a little bit too much of a drinking problem. The terrific new plumber-designate, is gradually working his way through all our temperamental and problematic plumbing and electrical systems, correcting all sorts of things that – as it turns out – had been done halfway, or totally wrong. It’s costing a fortune but step by step, things are undeniably improving around here. Or so we like to think. But we still are suffering the ongoing battles of the cuatro gatos, which adds to the craziness. The new arrivals are still fighting to establish territory, mercilessly chasing and ganging up on our original two. Poor little Rosie got cornered on the kitchen counter by Taby this morning and took a flying leap down into the open empty dishwasher. The poor kitty, who is tiny, landed right on all the upright prongs in the lower rack. She seems okay, but pobrecita, who knows. I decided enough is enough and I called our vet, Dr. Jesus, to come over and a) give them all the shots they need, especially rabies for Group 2 who are venturing outside now into the enclosed garden with its high walls. I asked if he could prescribe some calmantes (tranquilizers) for all of them so maybe we can ratchet down the inter-gato tension a bit. Group 1 is completely stressed out and maybe Group 2 will be less aggressive with a little relaxant. He said he’s going to try some natural remedies first and see if that helps the situation. He says some Vitamin B will help with all their stress (in their water bowl!) and there are herbal remedies to try to see if it helps the territorial battles before we go to real drugs. Thank god he makes house calls – we did not look forward to bundling four yowling cats, plus Reina the dog, who also needs booster shots, into carriers and going into the village to his office. Meanwhile, in the midst of the chaos, we had one of those Perfect Mexican Moments when Dr. Jesus did come to the house. He arrived with only half the vaccinations he needed, however, having forgotten the others. He gave the kitties what shots he had with him, and then our house call came to a screeching halt. Oh well, mañana. He is a wonderful veterinarian and much-loved by pet owners here, but in his other life he is a very serious classical guitarist and everyone in his family is musical. When he realized that he could go no farther with the vaccination project, we began chatting, as we often do, about music. In passing, he mentioned that he had his guitar in his car. Well, we said, since you don’t have the other vacunas with you, how about you play us something? A little Sor or Tarrega etude, or perhaps some Bach? Claro que si, and he ran out to his car and brought in the guitar and serenaded us for a half hour with several pieces. It was just delightful, hearing the music float through our house as the afternoon began to fade. The kitties, having been spared for the moment, ran off and hid for the rest of the day. Then he had to go to minister to some other cats and dogs and took his leave, saying he’d come back tomorrow with the missing vaccinations – which he did. But no recital on the second trip. Sadly, he said he had to get back to his office because two guys had a very old, much-loved Rottweiler he was going to have to put to sleep, and he said “I know I will have to stay with them for awhile, it will be very hard for them to say goodbye to this poor old perro, even though they know his time has come.” This is how he is; he consoled both of us so wonderfully when we had to put our much-loved Korat cat, Achille, to sleep a couple of years ago. I said to Arnold, “So typical, he forgets half of what he is supposed to do but then, also SO typical –something completely delightful and unexpected happens instead.” If you can just let go of your assumptions about precisely how things are to be done and in which order – difficult for us gringo types – sometimes you get really nice surprises, like the sound of a guitar echoing against the masonry walls of your house for awhile. In all the chaos and noise of our week of home maintenance, I tore a contact lens and without even knowing it really scratched up one of my eyes. Looks like I was in a bar fight. It’ll be okay in a few days but who needs it? But the good news is that the crew is all down there singing and bantering back and forth over the horrific racket of the chainsaws, drills, and the chipper outside. Without being too colonial about it, it is good to hear them belting out Mexican favorites at the tops of their lungs as they work. It reminds me so much of one of my all-time favorite pieces of music, the chorus of sailors in Act I of Britten’s Billy Budd, the sea chantey they sing while they are fixing the sails, readying the cannons, and scrubbing the decks of their ship, the Indomitable. On top of the stresses of my mother’s ever-so-agonizingly-slow decline, the ongoing territory battles of the cuatro gatos, the occasional armed robbery and murder here to keep us on our toes, we have had to deal with the outcome of Arnold’s PET scan, done just before we went off to Puerto Vallarta. Sure enough, as Arnold’s Mexican cardiologist, the wonderful Dr. B., suspected, the PET scan showed some additional problems in his heart, and he wanted to get in there to do an angiogram – and probably put in at least one “estent” (stent) as soon as possible. So our choices were – A) Go back to New York, where Arnold is in the hospital’s system and Medicare plus his insurance would pay for the whole thing. He mused, “We could go back to New York, I could go into the hospital overnight and then be out and guess what – we’d be in New York! We could shop and play and eat and see some performances and yippee! If we’re going to be spending all that money anyway.” B) Have it done in Guadalajara, where we would have to pay for everything ourselves, but one would come back from the procedure to one’s own home and bed – and garden terraza (terrace), with vodka and tonic at hand rather quickly – in a matter of an hour or so after being released from the hospital; no hotel rooms, flights or going through customs required. I did a rough calculation and figured that it was pretty likely to be a wash, or close to it, with New York hotel prices, airline tickets, food, and such. So it was really up to Arnold, where he wanted to have this done. He really liked the idea of going back to New York; everyone in the hospital speaks English, and they have even more fancy technology there (or so we thought) than they do here, should something go wrong. I wasn’t sure I agreed; my wifely instincts were telling me we shouldn’t mess around with this, getting on what amounted to four plane flights, the stress of traveling and then staying in a hotel, and the general hassle of it. What if something happened to him on a plane? And there was the nagging question as to why the wonderful specialized American cardiac center had utterly missed this possibly fatal blockage in the first place. In the process of putting his pacemaker in they had done god knows how many echocardiograms and x-rays during the time he was in there. But it was his decision, so I said “Of course, whatever you want to do” even though my gut said we should hie ourselves off to the catheterization lab in Guadalajara like NOW. Dr. B., who deals with Americans all the time, said “I get it about wanting to have Medicare cover it, but don’t delay on this too much longer” which for a Mexican is pretty much a five-alarm bell, at least in my view. Still, Arnold, undaunted, persisted in wanting to go back to the Ancestral Homeland. He got on the phone and contacted my cousin’s highly regarded cardiologist in New York City. Well, not exactly the doctor himself, but his office, whose Patient Care Coordinator told an eager Arnold rather briskly that unfortunately the first available appointment was mid-October and this was mid-July. Welcome to the U.S. medical care system. So, good news, you can have it done in the U.S. and Medicare and your insurance will pay for all of it. Bad news, if you wait five more months with a couple of badly clogged arteries you could be dead. The nice driver called us at 7 a.m. to say he was stuck in traffic himself coming from the city, but “no hay problema”, he had already texted the hospital and they were expecting us despite the delay. When we walked into the hospital’s reception area, a lovely gentleman in a while lab coat, Dr. B. SENIOR (our Dr. B.’s father, also a cardiologist, who works with him, it turns out) whisked Arnold away immediately to the catheterization lab. He told me to go in to his hospital room and wait, after I had filled out a bunch of paperwork. His room was basic, nothing fancy, a bed, a private bathroom, a TV, a couch for a family member to sleep on, and a bashed but very comfy old recliner. “Disculpe”, the doctor said, “this is a very old hospital and there are newer and prettier ones around, but this is the one where all the cardiologists work because this one is where all the best equipment is”. They moved him to his room, he promptly turned on the Olympics on the TV; I stayed with him for several hours and then decided to head home on the bus. Dr. B. saw him later that evening and said “You can go home tomorrow – how will you get back?” Arnold said “well, I’ll probably just take a taxi to the bus station and take the bus back.” “Wait, Dr. B. said, I have patients to see in my office in Ajjic tomorrow. I’ll pick you up here at 9 a.m. and run you back there, and your wife can pick you up at my office there around 10:30.” Talk about customer service! So the next morning, I picked him up at Dr. B.’s office here in the village, and brought him home. The four kitties and Reina greeted him, and later we both went out to the terraza for our regular evening cocktail and chat. The next day he took off the teensy weensy spot bandaids he had on each wrist – one where the catheter went in and the other where the IV port was. And that was that. Meanwhile Mexico just won its first Olympic gold medal in soccer and the neighborhood is going nuts, shooting off rockets and one can only imagine how crazy things are in town. Arnold is fine, recovering his equilibrium, paying bills at his desk, after having had the wits scared out of him by this series of events. I think this means that at least for the moment, life is going to go on. 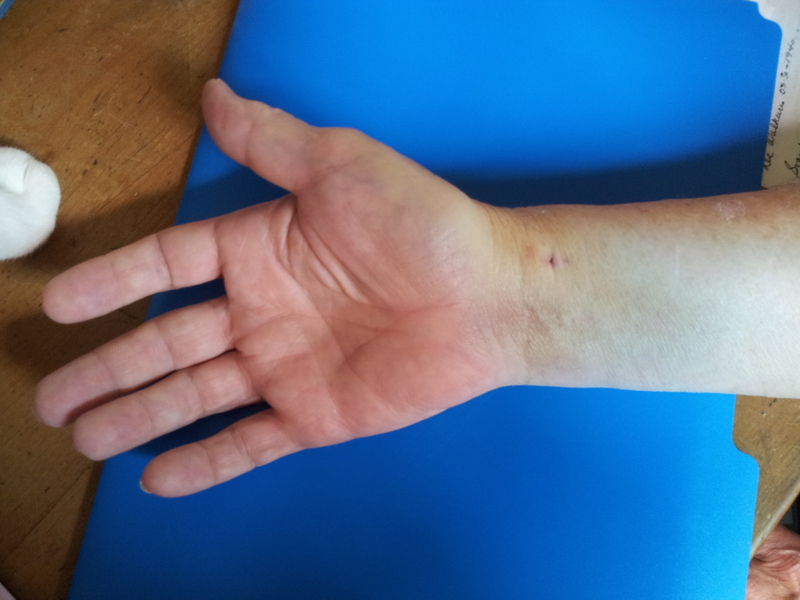 The massive wound left by Arnold’s stent procedure, through the wrist! No one except a crazy person would think of taking their Mexican maid and her teenage daughter, all expenses paid, on a week’s vacation to Puerto Vallarta. The four of us at the “delifnario” ready to play with the dolphins! And ordering the maid not to do anything, for once in her life, to just relax and let the camaristas do their job scrubbing the bathrooms and cleaning the place. Not even to make a bed. In utter defiance of every dictum of expat life (e.g. “Don’t become overly familiar with your household staff and their families”) we decided that Sofia needed a proper graduation present from secundaria. And that Rosa should come along too, to be spoiled a bit, see a new place, and to have some fun. We knew it would be a very special experience for them both. Sofia had never seen the ocean, never walked on the beach. Of course in the private school where she is a scholarship student, all the other kids have back and forth been to the beach for vacación all their lives. Arnold and I knew she would be thrilled at the chance to get a glimpse of a lifestyle her friends have known since they were born. I had read Paul Gallico’s Mrs. ‘Arris Goes to Paris as a kid and that book had a tremendous impact on me – the idea that even if you could only cross the class boundary once in your life, as if by magic, the experience would change who you were forever. We found a terrific “rent one condo and get one free” online deal for the summer, when it is mostly steamy, rainy and hot in Puerto Vallarta. But summertime is when kids are out of school, so there are promociones and sales to get people to come. 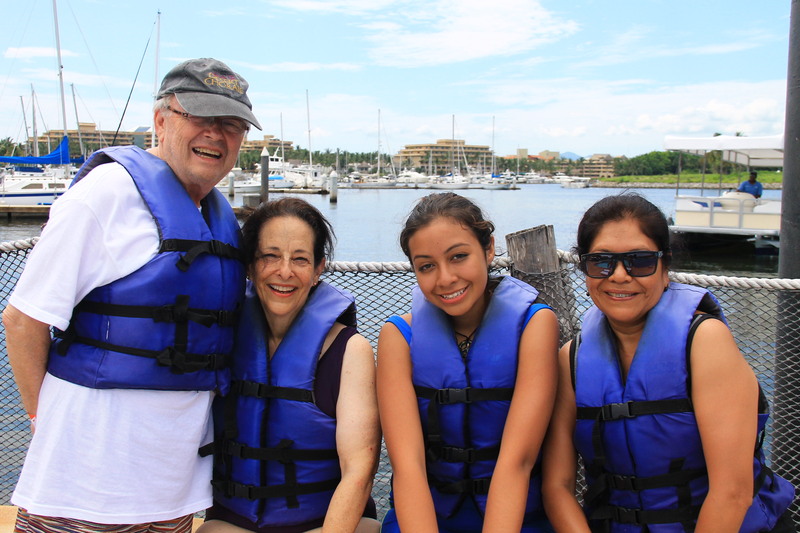 It is interesting for us, too, because the feeling in Vallarta is completely different from the winter when the Americans and Canadians are all there – mostly sans kids – fleeing the freezing weather up north. But in the summertime, just as it is in the States, families bundle everyone into cars and head for the beaches, the difference being that here in Mexico “everyone” includes not just the nuclear family but grandparents, aunts, uncles, in-laws, and every imaginable stripe of related kid. In fact, seeing the place overrun with Mexican families was just the lesson we wanted for Sofia. 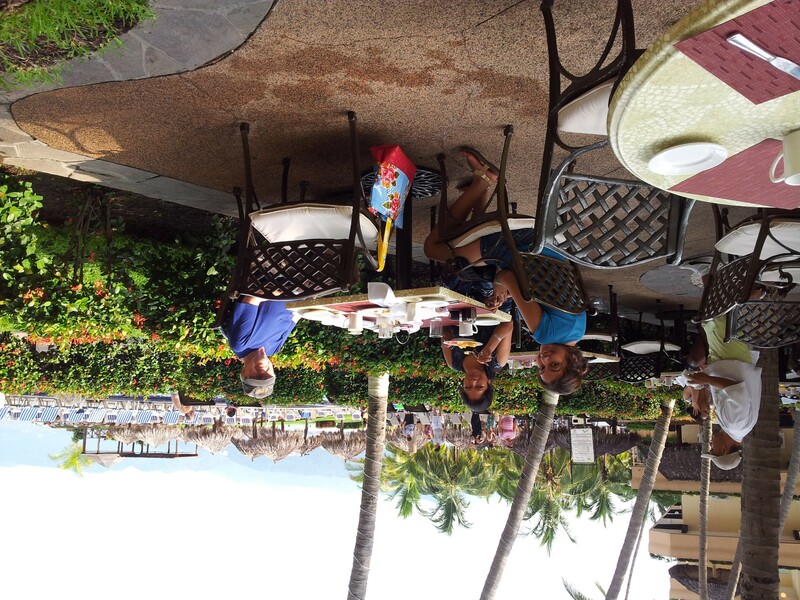 We wanted to give her some food for thought about her future, seeing this nice hotel crowded with Mexican families from abuelita (grandma) to the littlest babies, the generations all together for one week. We said to her “Think about what these people must be doing for a living, to be able to afford to bring a bunch of their relatives here and spend this time together….they can’t ALL be narcos!” Of course they aren’t; they are also doctors, executives, and engineers, members of Mexico’s growing and increasingly influential middle class. To Sofia this is all new: if she gets even through high school she will be the first one in her family to have made it that far. But after a year of lessons in the covered indoor pool of the local swim school she is now a strong swimmer and was more than ready to try her skills in the warm waters of Banderas Bay and enjoy the enormous pools at the resort…baby steps. Still, I was worried about the long-term consequences of this adventure, of course (as I always am). Here we are, taking two people from a completely different social class and background and introducing them to “our” world – a breezy week at the beach, an attractive hotel where they could each have their own room and bathroom (Sofia doesn’t even have her own bedroom at home), huge buffets served throughout the day; all you have to do is wave your arm with the plastic bracelet that says you’re on the meal plan, to have absolutely anything and everything you want delivered to you poolside or wherever. What would be the result of this? Was it cruel to open the doors to an experience where people very much like you are the ones waiting on you? When you can’t swim or have never seen the ocean, to be exposed to beach activities, playing in the sun by the pool? And if it was, at the end, a life-changing experience and a total blast for them, to have had a magical week? Then what? A la Cinderella – everyone returns to their customary places, sort of like “as you were, men” in the military; or musical chairs, where everyone scrambles to plop down when the music stops? I kept thinking about that, and how the one who doesn’t HAVE a chair gets tossed out. Survival of the fastest. Flying was ridiculously expensive for a forty-minute flight, so the four of us took the bus, heading west over the mountains, past extinct volcanoes and the agave fields of Tequila, then snaking down toward the coast through the Nayarit jungle. Even that was new for both of them, though Sofi, like all the kids I know, had to be prodded to lift her eyes from her cell phone (busy texting her friends) to catch that first glimpse of the blue ocean through the jungle. These kids experience life in a way totally different from my generation, where, when we travelled, we looked wide-eyed at all the scenery through the window of whatever conveyance we were on – car, train, plane, bus, whatever – and focused on every passing detail. Of course, in those days they hadn’t even invented computers yet, let alone Facebook and texting your pals. These kids experience everything through the filter of technology. I shake my head at how taking a photo or video of something is starting to replace actually SEEING it. But, my laments aside, obviously it’s the new reality for all of us. Once we got settled in our rooms, we looked around for some educational experiences, especially for Sofia, knowing that on her own, since she’s gregarious and not as shy as she used to be, she’d make friends down on the beach or by the pool and without some structure, she’d just hang out all day. 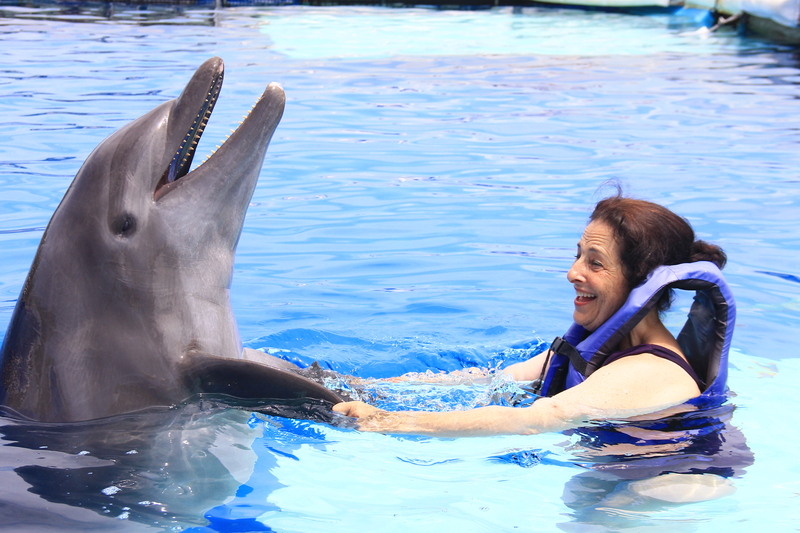 We found out about a program that sounded like fun – where you get to be a “Trainer For A Day” and go to the “delfinario” where dolphins and sea lions are kept – and learn about how they’re trained and try your hand at working with them yourself. We signed Sofia up for the full day class, and we adults signed up for the much shorter “dolphin encounter”, just for fun, ourselves. Then there was a “canopy tour” harnessed to cables that fly over the jungle. On another day we sent her out alone on a day-long snorkeling cruise. She had to get herself back by taxi – we told her where she had to go, gave her cab fare, and sent her off for the day. In my beady little mind, all preparation for the day when hopefully she gets sent off to college somewhere. Well, we can report that it all was a huge success; we all had a wonderful time. Rosa came into the pool with me guiding her (“Don’t go any farther than this, it’s too deep for you and I don’t want you to get frightened”) but after a few tries ended up – like everyone else on vacation at a resort – running from the pool to the Jacuzzi to wade into the ocean, and back again, and absolutely loved all of it. Sofia indeed made some friends; she swam and played beach volleyball until the sun went down. One day she rode on the “banana” – a scary-looking inflatable yellow tube several people straddle, one behind the next, hanging on for dear life. You’re taken on a hair-raising ride towed by a speedboat tearing madly through the ocean until the grand finale when you, and your compañeros sitting atop this thing, are dumped with much merriment into the water as it turns sharply and heads back toward the beach. Then you all have to swim back to shore (yes they all must wear life jackets). She loved snorkeling and said the brilliantly colored fish were amazing. At the end of the day, the boat returned to the marina in a driving rainstorm over choppy water, so that was part of the adventure, too. Now, without a doubt, Sofia has experienced the ocean and Rosa is over her fear of the water and can’t wait to get back in. Sofi has to begin her new life as a preparatoria student (high school) in a couple of weeks and with her new course load, she won’t have time for swimming lessons any more. She swims well enough now, so I asked Rosa if she’d like to take Sofia’s place at the swim school, go three times a week for a couple of months till she has learned the obligatory four strokes they teach you; and once and for all, at nearly 50, to learn how to swim. I said I’d pay for it as a special treat. She is signed up and will start in a few days. So it IS “As you were, men” but not quite. Both of them have seen a new place and learned a little of what it is to travel. Sofi learned how to snorkel and how to hang out with dolphins and sea lions and Rosa got into a Jacuzzi for the first time in her life, and we practically had to drag her out of it. We all got kissed by dolphins, nuzzled by a sea lion whose whiskers turn out to be surprisingly soft, and after it was all over we hauled our sandy selves back onto the Vallarta-Guadalajara bus and came back home. Life has resumed its normal routine but undoubtedly two lives have been changed. In other news, we were without power for a day, and it was just restored a few minutes ago. Someone stole a block’s worth of electrical cable for the copper, leaving the whole calle without any power for almost 24 hours. The electrical guys must have found some new cable in a warehouse somewhere, because everything, gracias a dios, seems to be back to normal now. Rosa came to clean on her regular schedule and thanked us again and again. “Never in my whole life, “she said, “did I think I would ever get in the water and not be afraid, let alone ride around on a dolphin…” She is a little apprehensive about swim class and doesn’t want me to spend any more money on her, but I have convinced her – “for once, let us do something for YOU alone – a few hours a week not taking care of your daughters, your grandchildren, or the house or worrying about us”; and now after some badgering from me about how I want her to be able to swim for pool safety around her grandchildren if nothing else, she’s eager to try it. Sofia went off to the new school to finish her placement exams for the next semester. Soon it’ll be time to purchase her new uniforms, getting ready for the fall. Jose came over to see us with his periodic report on Mother and to pick up a new supply of opera DVDs from Arnold. The battles of the cuatro gatos continue apace, and we are trying different things to see what will help them all get adjusted, with varying degrees of success. For the moment, at least, everyone got a chair.